If you already have Google Apps Free account and ready to set up Gmail as your business email for your domain (yourcompany.com). You have to direct the email for your domain to the Google Apps servers. It’s like registering your new address with the post office when you move so that your mail gets delivered to the right place. 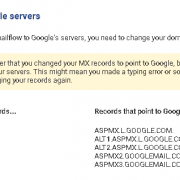 Here are the values to use in your domain’s DNS settings to configure MX records for Gmail with G Suite. Each record points to a Google mail server.